We observe the sun and the moon traversing the sky. We know that the moon is objectively orbiting the earth but the sun is not. Where then is the sun that is observed traversing the sky in daily and annual cycles? It is not in 3D space. It is in 3D time. Binary stars orbit their common barycenter. If the sun and earth were the only celestial bodies, it might not be clear as to which was orbiting which. But since there are other planets orbiting the sun, the only objective view is that all the planets are orbiting the sun (more precisely, the barycenter of the solar system, which is in or near the sun). This post continues previous ones contrasting ancient and modern space and time, such as here. 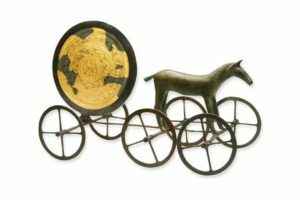 The above bronze-age depiction of the Sun on a chariot shows a common image from antiquity: the Sun crossing the heavens daily. The path of the Sun was also described as traversing a celestial circle (or sphere) and going around a racecourse. These images show that the clock of the Sun was considered as covering more than one dimension, in contrast to the modern concept of scalar duration. These are more examples of the interchange of travel distance with travel time that occurred in the transition from ancient to modern thinking. We can undo this interchange and find an alternative way of conceiving motion.